Zoho is an enterprise software company that has bootstrapped itself to hundreds of millions of dollars in revenue, and profitability without ever taking a cent of venture capital funding. Founded in 1996, in a similar era to Yahoo and shortly before Google, the company began with six employees and now employs over 4,500 people. Revenue is approaching $1 billion and continues to grow 40% year-on-year. Zoho gets about 50% of its business from the US, 30% from the UK, and the remaining from other parts of the world. Zoho currently has about 30 software products bundled under three broad segments — collaboration, business and productivity tools. Over 13 million people worldwide have subscribed to Zoho products, the most popular is Zoho CRM for customer relationship management with over 350,000 new subscribers signing up every month. But there is also Zoho Creator which allows users with no programming experience to build their own customized online databases and forms. With a simple drag-and-drop interface, you can create basic to incredibly complex databases to meet just about any need. You can either build the database from scratch or select from a number of pre-built databases to work with. The Zoho office suite, which includes a word processor, a spreadsheet and presentation tools, is similar to office suites such as Google's Docs and Microsoft’s Office365. If you're looking for a cloud-based tools that can help you grow your business with little cost and even less headache, take a look at the Zoho suite and if you haven't experienced the power that is Zoho, sign up for a free account and see what it has to offer your business. Reach Out and Engage. Create, send and track effective email campaigns that help you build and sustain lasting relationships with your customers. Focus on building a relationship with your customers. Automate your email marketing with email workflows and autoresponders. 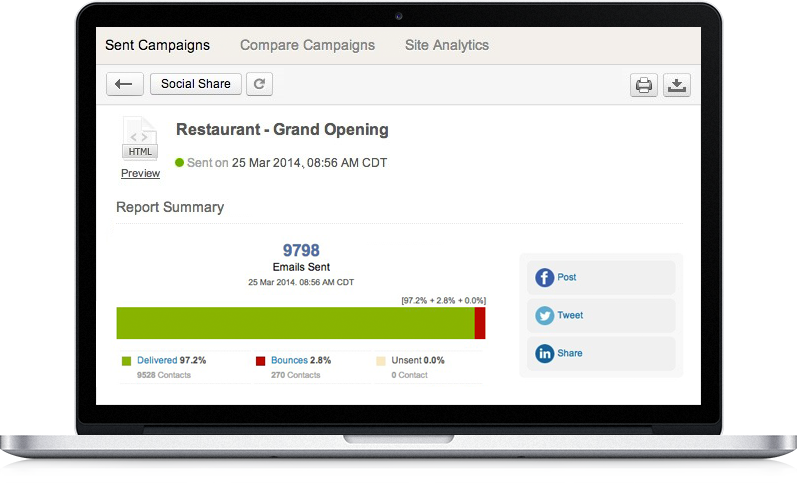 Know the performance of your email & social campaigns. Understand your audience and improve future campaigns. Sync contact lists from Zoho CRM and see the results of your campaign inside your CRM account. Share campaigns on social media sites and also create landing pages for your Facebook audience. Your Social Workplace. 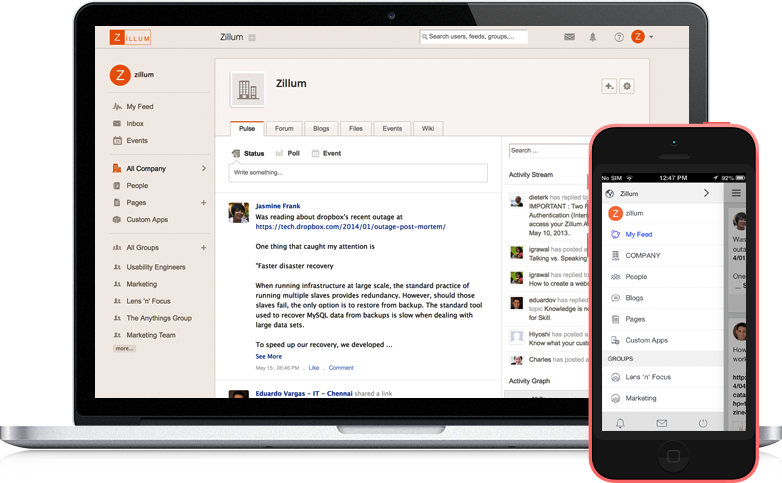 From ideas to execution, Zoho Connect is your organization's private social network that redefines the way your employees and teams share information and collaborate with each other. Stay on top of the latest news within the company with Activity streams. Get live updates from your colleagues. Get all notifications, @mentions and private messages sent to you, all in one place. Now you don't have to navigate elsewhere to access them. Get teams together with the help of groups. Solve problems creatively putting all heads together. Get things done faster by working together. Manage your documents in one place. Share files instantly. Create or edit documents with online editors and share them within the organization. With its easy drag-and-drop interface, anybody in the organization can build apps regardless of their level of technical expertise. Hassle-free Invoicing. Zoho Invoice is a simple, intuitive invoicing software designed to help you craft the perfect invoice, track payments and get paid faster online. Save Time and Effort With Zoho's Online Invoicing Software. Get done with your monthly invoicing in seconds. 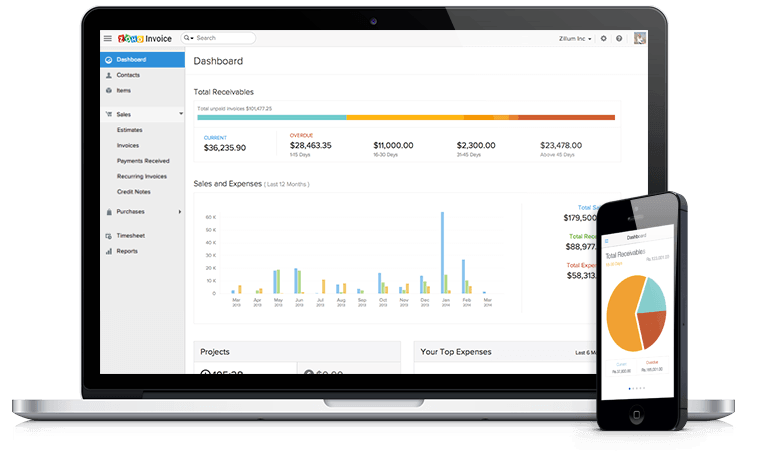 Create and send beautiful invoices and impress customers. Effortlessly track time for projects and invoice your customers. Set the timer and get immersed in your work. Focus on your work while Zoho does the payment follow up. Feed Zoho the data and set it to auto-pilot. Get paid faster and on time with online payments. Thank clients by sending an automated personalised thank you note. 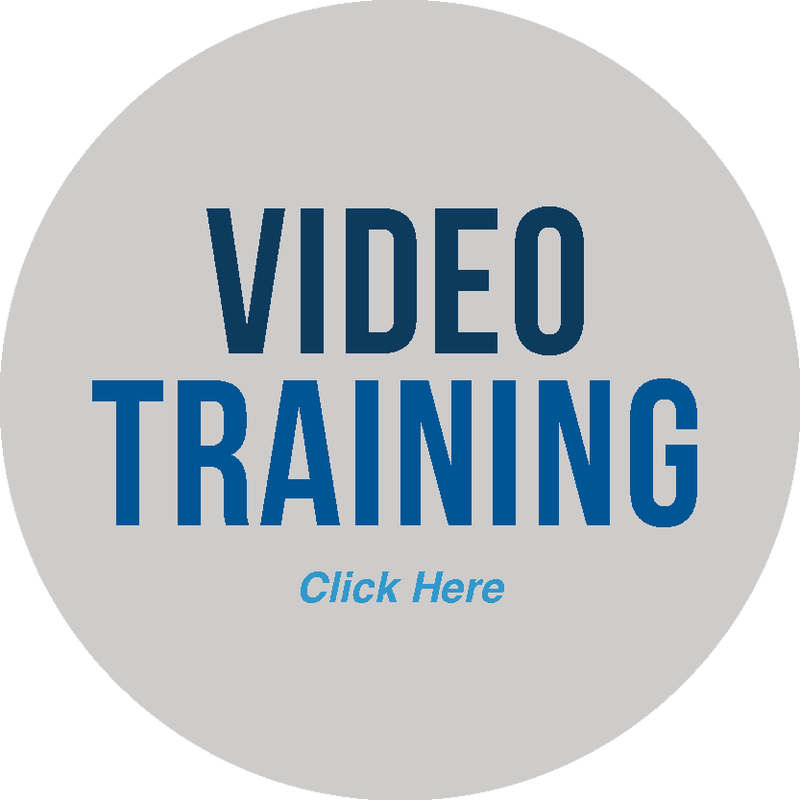 Gain critical insights on business performance. Know your best customers and your best selling products. Project Management, as Effective as it Gets. 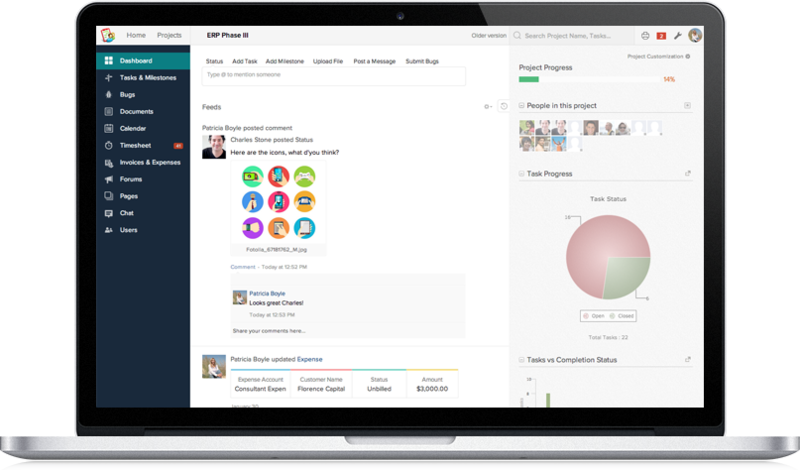 Plan, track and collaborate using the preferred project management app of more than a million users. Get Things Done Faster. Keep track of everything right from simple tasks to complex projects. Milestones, task lists and tasks help you easily break down complex projects into easily manageable units. Get more refined control with subtasks, recurring tasks and dependencies. Gantt charts provide a detailed visual on the progress of your tasks in comparison to what was planned. The resource allocation chart lets you know who is free, who is engaged and who is overloaded. Employees, clients, vendors or consultants, nearby or from remote locations, all can work together seamlessly with a set of collaboration tools. All working on a project can easily log their billable and non billable hours using timesheets. The built in integration with Zoho invoice automatically generates invoices using these. Online Reporting and Business Intelligence. 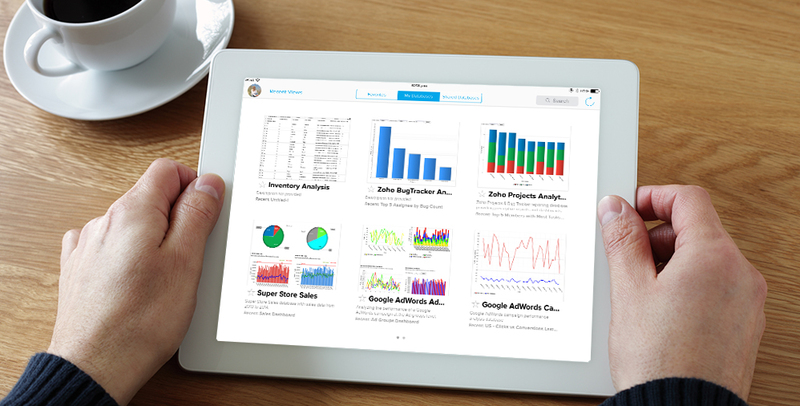 Empower your mobile workforce with the Zoho Reports iPad optimized app. View and share interactive reports and dashboards. Access reports from mobile devices. Securely upload spreadsheets and other tabular data (like CSV, TSV, XLS and HTML files). Or add data directly to a report using a 'Spreadsheet-like' interface. Push data from hosted or in-house (behind firewall) business applications and databases for reporting and analysis. Visually analyze and build insightful reports & dashboards with the easy to use drag-and-drop interface. No IT help required! Use a wide variety of charts, pivot tables and tabular view components to build insightful reports and dashboards. ISVs and Developers can use the powerful development platform to build/integrate reporting and analytical capabilities into their business applications. Deliver Unmatched Customer Service. Zoho Support is web-based customer service software designed to help you focus more on creating customer happiness everyday. Deliver Unmatched Customer Service Across Multiple Channels, Multiple Languages and Multiple Time Zones. Customer interactions from email, phone, chat, social media & more pulled into a single place. Convenience is the word. 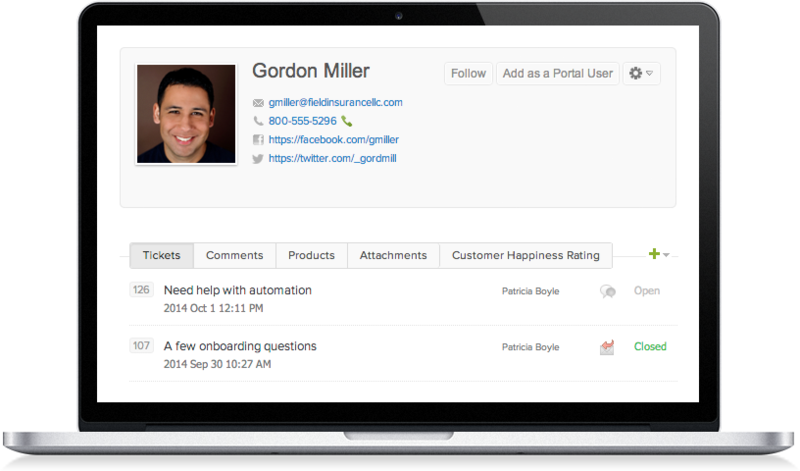 Automate frequent activities and dramatically increase the productivity of your team. Measure things that matter. Understand what & how to improve. Create more customer happiness. Now, repeat. Know more about the people behind the tickets. Understand them better. Close tickets, open happiness. Help is best delivered in your native tongue. With native support for nine languages, consider that covered. 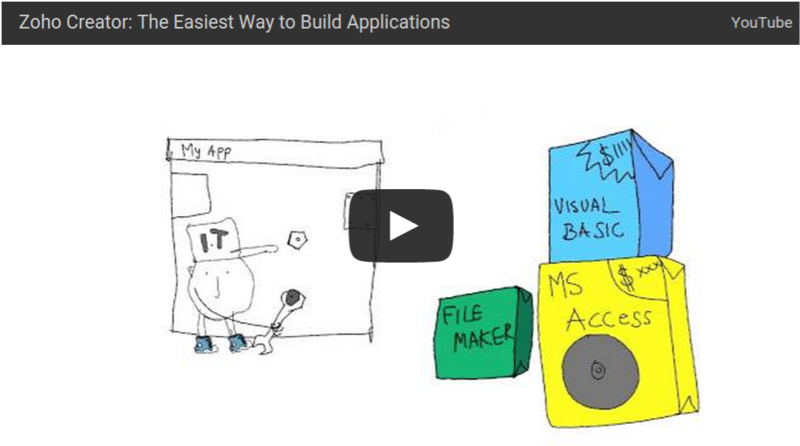 Launch Database Apps on Your Own. Zoho Creator with its drag-and-drop builder makes it extremely easy for business users to build their own custom apps. Custom Apps, from simple Contact Manager to complex CRM can be built in minutes with the drag-drop builder. 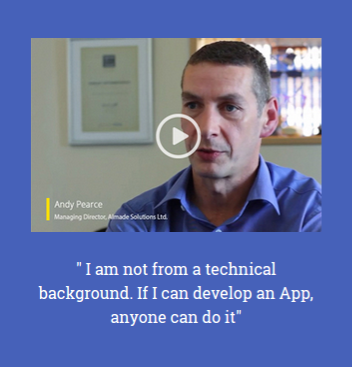 No technical expertise required. Manage your company's business processes with Custom Workflow by setting rules, adding logic and creating if-else scenarios. Streamline and automate. Base your decisions and actions on data - collect, analyze and derive insights. Creator stays in the cloud and so you save big on infrastructure. 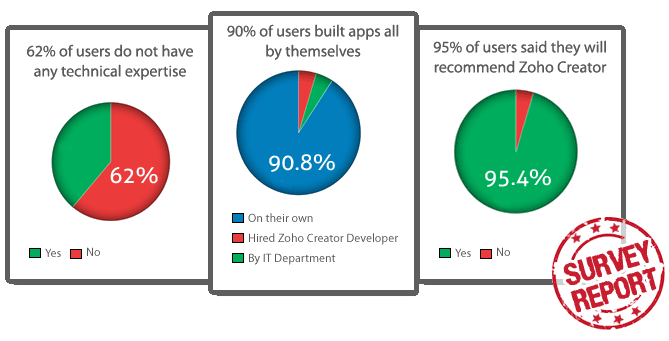 The ROI on an App builder is very high as you can build a variety of Apps in future. Seamlessly access data in faster and lighter mobile Apps. You are only a touch away from office with the native Zoho Creator Apps for iOS and Android devices.